“In Flanders Fields, the poppies blow beneath the crosses row on row that mark our place…”. The words of this famous poem, written by Canadian medic John McCrae in 1915, mark a favorite moment for many who attend the annual Memorial Day ceremony at the Flanders Field American Cemetery. In a special tradition that started decades ago, a high school student is selected from one of the international schools in Belgium to read the poem aloud. This oratorical honor rotates among the participating schools that include the Antwerp International School, the Brussels American School (Sterrebeek), the International School of Brussels and St. John’s International School (Waterloo). Additionally, a translated version of the poem is read in Dutch by a local Flemish high school student from the Stedelijk Kunstacademie Waregem. All students are selected and coached by a school representative. At this year’s ceremony, the St. John’s International School has selected Daniel Hincka to read the poem. The Stedelijk Kunstacademie Waregem will name their representative soon. 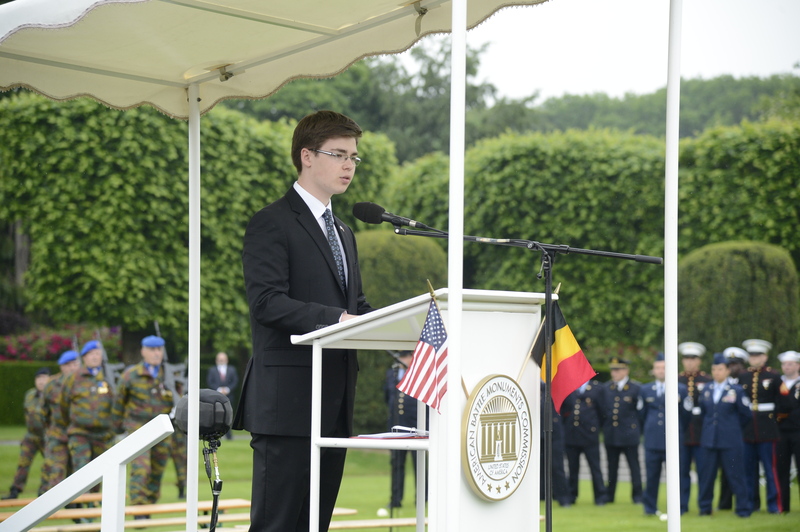 AOMDA Belgium encourages meaningful youth participation in all Memorial Day ceremonies. In a tradition that started in 1923, elementary-school children in Waregem today sing the national anthems of the United States and Belgium during the Flanders Field ceremony. In 2008, the same tradition was started at the Ardennes American Cemetery where local school children from Rotheux sing the anthems. At Henri-Chapelle American cemetery, local school children from one of the local youth associations compose and deliver a personal tribute. Local American and Belgian scout groups also volunteer to support the ceremonies.